On a dreary Thursday night in Manchester, I set off to The Ruby Lounge. I have to say I’ve always like this place as a venue. Decent sound system and usually a fun atmosphere, depending on who’s playing. Though the promoters are really good at getting consistently great shows on. 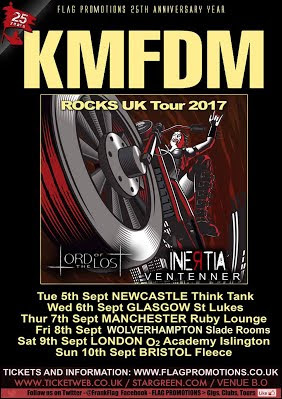 On this night, German industrial-rock icons KMFDM hit the city and I could not have been more excited. These guys are the reason I got into this genre and style of music and I was really excited to hear more of the same. The whole “dance-metal” style of music always sounds good to me. I like the mix of electronica and grungy sounding metal. However, when I saw that there were four bands on the bill, I knew I was in for a bit of a long night. I know I’ve said before, but I am not a fan of four band nights (well just anymore than three is not good for me). Things always feel rushed and the crowd usually feels exhausted and defeated by the third band in. So yeah, I was preparing for a good night of good music and I since I hadn’t heard of any of the supports before so I was hoping for good things. This was a pretty decent opening band. Ventenner, is a British industrial rock with that utilize all of their assets excellently. The rock was well done and the electronic elements were well incorporated. They got the crowd going with a fantastic atmosphere. Their songs were really great and they clearly have a lot of confidence.That much certainly showed in their performance. Yet, I don’t think that this necessarily the best produced set. It definitely hit it’s moments, but there were times where the bass was overwhelming and the vocals didn’t get through very clearly. The sound was so muddy and unclear. Also, I think they could have engaged the crowd a little more. Although that could have been the time constraint due to there being four bands playing in a small space of time. I still think that the band is great, the songs are 100% solid. They have a lot stage presence and charisma, that really showed in their faces. They were clearly excited to be playing and loving it. Even when the bassists strap broke, I didn’t notice until they pointed it out. They were just so into their performance that I was getting into it as well. I thoroughly enjoyed them and I look forward to seeing them again. OK… I did not expect that! What on earth was that. It was awesome is what it was. Lord of the Lost, just completely smashed this set and I was instantly engrossed by them. After they were done it was a case of “shut up and take my money”. Yeh. I loved this set. These guys were charismatic, energetic and their songs were insanely good. Their music was fun and upbeat but also had a gothic edge to it. I was completely sold on the style, the presentation and how these guys held themselves on stage. The very way they grabbed everyone's attention was almost expert-like. Their dark rock music was something special, it wasn’t overly silly, like many bands of their ilk. It was well executed enough for me to take them more seriously than more gimmicky bands who play this style. Theatrical and dramatic, yet oddly loose and silly. The lead vocalist was really entertaining, he had such a command over the audience and when he got his light up guitar out. Which was spectacular. I have to say this was a really great set full of entertaining tunes and a lot of personality. I highly recommend you check these guys out. I was rocking out all the way through this set and I look forward to seeing them again and believe me, I’m going to go see them again! To be honest, not too much to say about these guys. They were fun like every other band on the line up but I’ll be honest I sat back and chilled for their set. This is the problem with 4 band nights for me. I just get exhausted and by the time a third support comes on, I just want the headliner. Anyway. Inertia, were pretty decent. It was a really cool mix of early 90’s dance music and blues style punk rock. I will say this for them, they were supremely energetic especially the lead vocalist, who was running around the stage like a freaking mad man. The crowd was clearly into it with people rocking out up front. They played with passion and intensity but like I said I was quite tired at this point and I was just waiting for the headliners. Not to say they weren’t good, they were. I hope to see them again when I’m more in the mood to see them. It was that kind of weird sound that I really get into. Good band, I was just in a stinker of a mood. Finally, it’s time to talk about the headliner. KMFDM hit the stage and the crowd was packed in tight to the stage area. This was a really fun set. The setlist mostly consisted of the new album tunes. Which was fine, I’ve been listening to “Hell Yeah” a lot lately and I am really into those songs with a few good oldies in there for good measure. Although they didn’t play “Ultra” which is my favourite song, that would have made my night! In all honesty though, they played with so much vigour and energy it made for an awesome time. Vocalist, Lucia Cifarelli was quite a sight as she moved up at the front of the stage and got the crowd amped a little. The music was really well produced live with every instrument and vocal performance coming through really well. The band were obviously having fun on the stage, posing off and Sascha Konietzko grooving with his synths up at front. The whole thing was just spectacular, the bass was slamming, the beats were jamming, honestly who doesn’t like this kind of gig. If I have one complaint it’s that they barely interacted with the crowd, they just plowed through their set. Which is fine I suppose but I always like a bit of crowd banter from an artist on a stage. Other than that I had no real issue with their set at all. I’ve been listening to KMFDM since I was 14 and this was well worth the 11 year wait to see them. The crowd was fun to be in and the band gave them something to special to move and groove to. I absolutely loved this night and it was another night worth spending in Manchester.